Field Cottage is a single storey Norfolk brick and flint cottage which has lovely countryside views, within walking distance of Brancaster Staithe's harbour and local places to eat & drink. It has 3 bedrooms and 2 bathrooms and has been extremely well-equipped with all the mod cons, providing a great base for a family holiday or an off-season break for walkers, bird-watchers or anyone wanting to explore the beautiful North Norfolk coast. Kitchen: Has stunning open countryside views and is well-equipped with electric oven, full height 50/50 fridge/freezer, microwave and dishwasher. There is a dining table seating up to 6. Sitting Room: Light and spacious with doors opening onto the garden. There is an electric log-effect fire, 2 sofas, Panasonic HD Freeview TV, DVD player. There is also the added advantage of broadband in the cottage. There is a telephone which receives incoming calls only. Bedroom 1: King-size bed, bedside tables and lamps, chest of drawers and wardrobe. There is a small en-suite shower room with walk-in shower, basin and WC. Bedroom 2: Twin beds, bedside table and lamp, chest of drawers and a wardrobe. Bedroom 3: Full-size bunk beds, chest of drawers. Bathroom: Bath with electric shower over, hand basin and WC. There is a travel cot and high chair available if required. There is a shingled drive leading off the coast road up to the cottage where there is off-street parking for 2 cars. Utility room situated behind the garage, accessed from the garden, with a washing machine, tumble dryer, iron and ironing board. There is a safe enclosed lawned garden to the side and rear of the cottage, with lovely views across the open countryside. The patio has table, chairs and a gas barbeque. It is only a short walk to the Jolly Sailor pub, the White Horse pub and restaurant and the harbour at Brancaster Staithe. Sorry, but dogs and smokers are not permitted here. Our first visit to Field Cottage but hopefully not our last. Wonderful place, especially for my 92 year old mother. Thank you. Our second visit to this well equipped and comfortable cottage. We hope to come here again. Thank you. Our 2nd visit to Field Cottage and a great week again - perfect base - visited Wells, Houghton, RSPB Titchwell, Brancaster beach and Sandringham. Recommend pizzas at The Jolly Sailors, Thornham - love staying here. Second visit to this cottage. Lovely location. Very hot all week. Having been coming to this bit of coast for over 40 years so know it well. Thank you for another lovely holiday here. 2nd visit - perfect location for beaches and birdwatching. Very hot all week. Thank you. Fantastic week - glorious weather and lovely cottage which is perfect for our now walking 20 month old. Thank you for the use of your cottage last week we had a great time there with our family, it is a beautiful property and location and would recommend Field Cottage to anyone. Thanks again. A bustling village with an attractive harbour which is just to the east of Brancaster (staithe means wharf, or landing stage). There is a well-supported sailing club here and in the summer at high tide there is always a crowd of people and boats jostling to get onto the water. The sea still gives a living to many in the area though and Brancaster Staithe is famed for its mussels, which may be bought locally at The Fish Shed along the coast road. Just off the coast of Brancaster Staithe, Scolt Head Island is a four mile long sand bar housing a National Nature Reserve well-known for terns, oystercatchers, and ringed plovers. You can take a boat trip with Branta Cruises to visit the island. The village is a picturesque one, with typical flint walling on many cottages, and popular with second home owners and holiday makers. There is good beer and food available throughout the day at the Jolly Sailor's pub, or for more of a treat with stunning views and delicious food there is The White Horse overlooking the marshes which has just been voted the county's eatery for 2018 in the National Pub and Bar awards. Next to Brancaster Staithe is Burnham Deepdale which has a Norman church, a visitors centre and a good selection of shops, including a small supermarket, Fat Face and Gone Crabbing. After a brisk walk on the beach or an invigorating sail there's nothing better than a trip to the ever popular Deepdale Café, renowned for its hearty English breakfasts. 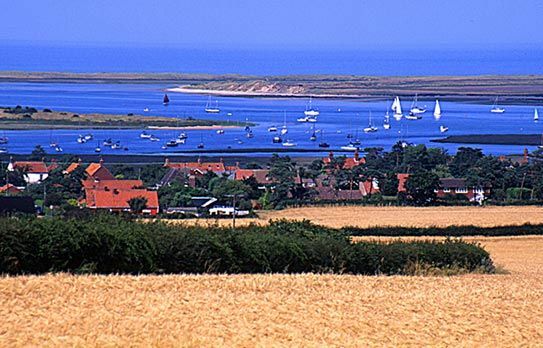 If you would like to see more of our holiday homes in and around the Norfolk coastal town of Brancaster Staithe, please click here.